Facebook has 1.8 billion users worldwide. And with great power comes great responsibility. Thankfully, Facebook is putting its huge database to good use with a new effort called Community Help. This effort, which is part of Safety Check, helps you help others during a crisis. Disaster can strike at any time, anywhere. It’s a sad fact of this thing we call life This Annoying Life: 8 Technologies Guaranteed to Frustrate This Annoying Life: 8 Technologies Guaranteed to Frustrate Technology is meant to improve our lives. To take the weight off our shoulders. To do the dirty work and save us from suffering stress. But that isn't always the case. Read More that one moment you can be enjoying your day, and the next moment you can get caught up in something horrific. Whether that be an earthquake, a flood, or a terrorist attack. In 2014, Facebook unveiled a feature called Safety Check. This kicks in when a disaster strikes, notifying users about what’s happening in their locale. People caught up in the event can then quickly and easily inform family and friends that they’re alive and well. 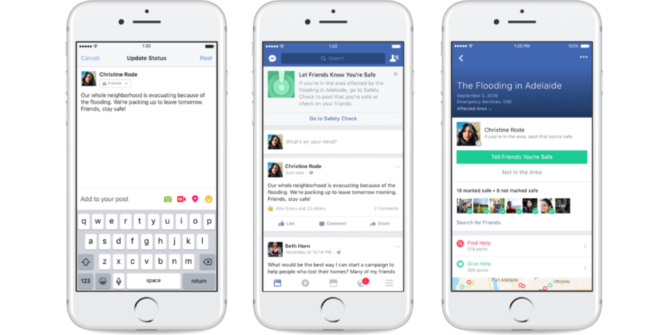 Facebook is now adding another string to Safety Check’s bow in the form of Community Help. This kicks in in the immediate aftermath of a disaster, connecting people who need help with those willing to offer help. Those caught up in the disaster can “Find Help”, and select the kind of assistance they require. Categories include food, water, shelter, and transportation. Everyone else can “Give Help”, offering to provide the services or supplies to those in desperate need 7 Apps and Websites to Help You Give Money to Charity 7 Apps and Websites to Help You Give Money to Charity Give more money to charity and become a more engaged human citizen by using these 7 apps and websites. Read More . Users have to be over 18 to use Community Help, and Facebook is keen to remind people to use basic common sense when arranging to meet strangers off the internet. Regardless, initial contact can be made via direct message. Facebook Product Designer Preethi Chethan explains more in this Medium post. Despite the risks of scammers taking advantage of people’s good natures, Community Help is a great idea. While it was noble of Facebook to provide a platform for people to check-in during a disaster How Safe Are Your Friends? (And How To Securely Donate To a Disaster Area) How Safe Are Your Friends? (And How To Securely Donate To a Disaster Area) Facebook has really moved on from being just a place to poke your friends and play Farmville, although many people haven't quite realized that yet. Have you noticed Facebook's disaster efforts? Read More , securing help for those caught up in it is infinitely more useful. Community Help will initially be available to users in the United States, Canada, Australia, New Zealand, India, and Saudi Arabia. However, Facebook is committed to rolling it out to more countries in the future as the social network gathers feedback from those who make use of it. Have you ever used Safety Check on Facebook? Under what circumstances? If you were caught up in a disaster how long before you opened Facebook? Would you offer assistance to those in need using Community Help? Please let us know in the comments below! Explore more about: Emergency, Facebook, Online Community. Sure, while they help themselves to your money.